MASAI MARA - LAKE NAKURU - SAMBURU AMBOSELI - TSAVO 11 days! At 9:00 am, leave Nairobi via the Great Rift Valley for Maasai Mara Game Reserve with picnic lunch and game drive en route. Dinner and overnight at the camp. Two full days of game viewing. The black-maned lion, leopard, cheetah and buffalo can be seen. All meals and overnight at the campsite. At 8:30 am, after breakfast, leave Maasai Mara for Nakuru. Picnic or hot lunch en route. Lake Nakuru National Park is often described as the "Worlds Greatest Bird Spectacle" Dinner and overnight at Nakuru camp. At 6:30 am proceed for a pre-breakfast game drive in Lake Nakuru National Park. Noted for its huge concentration of flamingos. Beside birds, it is possible to see small game like water bucks, impala, rhino and buffalo in the garden surroundings. After breakfast leave for Samburu, lunch and game drives en route. Morning and afternoon game drives in Samburu Game Reserves, lunch and leisure break between 1:00 pm and 4:00 pm. All meals and overnight at the campsite. After breakfast depart for Amboseli National Park via Nairobi, lunch and game drive en route. Dinner and overnight at the camp. At 6:30 am, proceed for an early morning pre-breakfast game drive and return to camp. After breakfast proceed for a further game drive. Lunch at the camp at 3:30 opm, proceed for a late afternoon game drive returning to the camp for dinner and overnight. Early in the morning, proceed for your last game drive as you leave camp for Tsavo West National Park, game viewing and lunch en route. On arrival in Tsavo set up camp. Dinner and overnight. Visit the Mzima Springs en route to Tsavo East National Park where hippos and crocodiles can be seen swimming in the clear waters. Afternoon game drives in Tsavo East National Park after setting up camps. 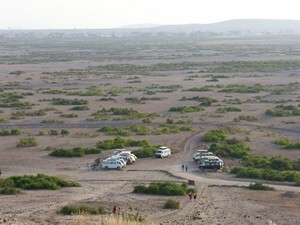 At 8:30 am, after breakfast, proceed for a game drive. After lunch leave for Nairobi.